One of the most important features of Caché is the ability to access database items as objects rather than rows in relational tables. 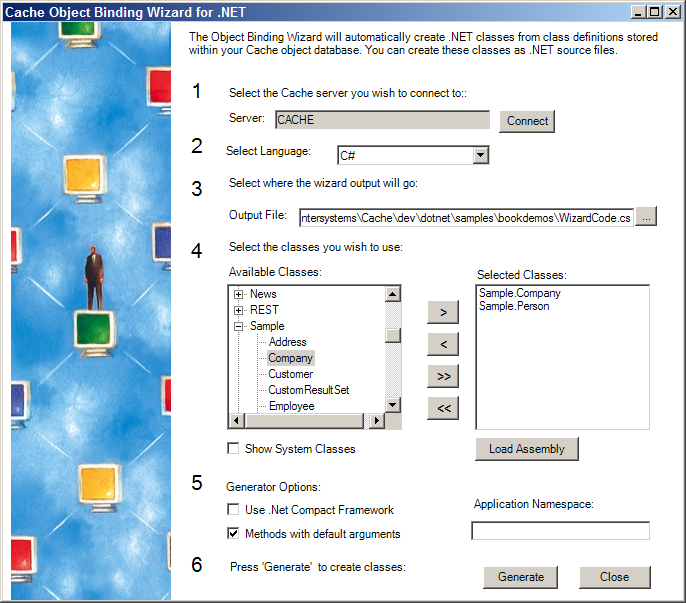 In Caché .NET Binding applications, this feature is implemented using Caché proxy objects. Proxy objects are instances of .NET classes generated from classes defined in the Caché Class Dictionary. Each proxy object communicates with a corresponding object on the Caché server, and can be manipulated just as if it were the original object. The generated proxy classes are written in fully compliant .NET managed code, and can be used anywhere in your project. This section gives some concrete examples of code using Caché proxy classes. Introduction to Proxy Objects  a simple demonstration of how proxy objects are used. Generating Caché Proxy Classes  using various tools to generate proxy classes. Using Caché Proxy Objects  using proxy objects to create, open, alter, save, and delete objects on the Caché server. Using Caché Queries  using a pre-existing Caché query to generate and manipulate a result set. Using Collections and Lists  manipulating Caché lists and arrays. Using Relationships  using Caché relationship objects to access and manipulate data sets. Using I/O Redirection  redirecting Caché Read and Write statements. Although the examples in this chapter use only proxy objects to access Caché data, it is also possible to access database instances via ADO.NET classes and SQL statements (as described in Using Caché ADO.NET Managed Provider Classes). Both types of access can be used in the same program. The examples presented in this chapter are fragments from samples provided in the bookdemos project (see The Caché .NET Sample Programs for details). It is assumed that you are familiar with standard coding practices, so the fragments omit error trapping (try/catch) statements and other code that is not directly relevant to the examples. For complete, working versions of the code examples, see SampleCode.cs, located in <Cache-install-dir>\dev\dotnet\samples\bookdemos (see Caché Installation Directory in the Caché Installation Guide for the location of <Cache-install-dir> on your system). 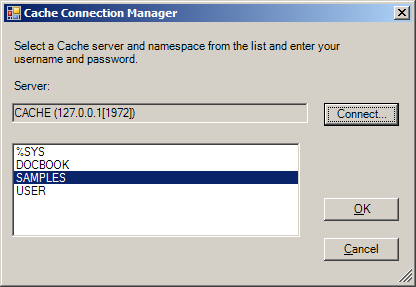 CacheConnect.ConnectionString = "Server = localhost; "
+ "Port = 1972; " + "Namespace = SAMPLES; "
+ person.Id() + ": "
Both projects have code to open and read the instance of Sample.Person that has an ID equal to 1. The project includes a file (WizardCode.cs) containing code for the generated proxy classes. See Generating Caché Proxy Classes for a detailed description of how to generate this file and include it in your project. The instance of Sample.Person is accessed through a proxy object rather than CacheCommand and CacheDataReader objects. In many cases, code with proxy objects can be far simpler to write and maintain than the equivalent code using ADO.NET Managed Provider classes. Your project can use both methods of access interchangeably, depending on which approach makes the most sense in any given situation. Using the Caché Object Binding Wizard  a GUI program that leads you through the process of generating proxy classes. Running the Proxy Generator from the Command Line  a DOS program that allows you to generate proxy classes from a batch file or an ANT script. Generating Proxy Files Programmatically  calling the Proxy Generator methods directly to create proxy classes from within a .NET program. Adding Proxy Code to a Project  what to do with new proxy files once you've got them. Methods Inherited from Caché System Classes  a set of standard methods that the Proxy Generator adds to all proxy files. The Caché Object Binding Wizard can be run either as a stand-alone program (CacheNetWizard.exe, located in <Cache-install-dir>\dev\dotnet\bin\v2.0.50727 by default) or as a tool integrated into Visual Studio (See Adding the Caché Object Binding Wizard to Visual Studio). For the bookdemos project, you would select Language: C#. Generally, this will be the same folder that contains the .csproj file for your project. 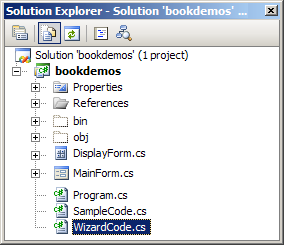 In this example, the file will be named WizardCode.cs, and will be placed in the main bookdemos project directory. For this exercise, you should select the Sample.Person and Sample.Company classes from the SAMPLES namespace. The Sample.Address and Sample.Employee classes will be included automatically because they are used by Sample.Person and Sample.Company. If you check Show System Classes, classes from %SYS (the standard Caché Class Library) will be displayed along with those from SAMPLES. Use .Net Compact Framework  generate proxy code for mobile applications. Methods with default arguments  generates some optional overloads for certain system methods. Application Namespace  optional namespace that will be added to the names of all generated proxy classes. For example, if you entered MyNamespace, the generated code would contain references to MyNamespace.Sample.Person rather than just Sample.Person. The server will not know about this namespace. To ensure that proxy objects referenced through relations will be generated properly, you should either use the name of your application's main assembly, or set CacheConnection.AppNamespace to the value you enter here (see Instantiating a Proxy Object by Name in Using Caché Proxy Objects for more information). The generated file can now be added to your project (see Adding Proxy Code to a Project). by default) is useful when the same set of proxy files must be regenerated frequently. This is important when the Caché classes are still under development, since the proxy classes must be regenerated whenever the interface of a Caché class changes. -conn <connection string>  standard connection string (see Creating a Connection). -path <full filename>  path and name of the output file for the generated code. Type of output file to be generated is determined by extension of the filename (for example, C:\somepath\WizardCode.vb will generate a Visual Basic code file). -dir <path>  directory where the generated proxy files will be placed. -src-kind <cs|vb>  type of proxy file to generate. For each class, a file named <namespace_classname>.<src-kind> will be generated in the directory specified by -dir. Options are cs or vb. -class-list <full filename>  path and name of a text file containing a list of the classes to be used. Each class name must be on a separate line. -gen-default-args <true | false>  switch that controls generation of optional overloads to certain generated system methods. Options are true or false. -app-nsp<namespace>  optional namespace that will be added to the names of all generated proxy classes. For example, if you entered MyNamespace, the generated code would contain references to MyNamespace.Sample.Person rather than just Sample.Person..
-use-cf <true | false>  switch that controls whether code is generated for mobile devices or standard PCs. Options are true or false. The first call generates a single file containing several proxy classes. This command generates exactly the same WizardCode.cs file as the Object Binding Wizard (see the example in Using the Caché Object Binding Wizard). The second call generates one proxy file for each class, and generates Visual Basic code rather than C#. The filenames will be of the form <namespace_classname>.vb. Both calls use the same connection string, output directory, and class list file. Although only two classes are listed, proxy classes for Sample.Address and Sample.Employee are generated automatically because they are used by Sample.Person and Sample.Company. Generates a new CS or VB proxy file that may contain definitions for several classes. filepath  A string containing the path and filename of the file to be generated. generator  A CodeDomProvider object that generates either CS or VB code. classlist  An IEnumerator iterator pointing to the list of classes that will be generated. options  a CacheClient.ObjBind.GeneratorOptions object. errors  An IList array used to store any returned error messages. Generates a separate CS or VB proxy file named <classname>.<filetype> for each class in classlist. dirpath  A string containing the directory path for the files to be generated. filetype  A string containing either ".vb" or ".cs", depending on the code to be generated. For a working example that uses both methods, see the Proxy_8_MakeProxyFiles() method in the bookdemos sample program (see The Caché .NET Sample Programs). The following code fragments provide examples for defining the method parameters, and for calling each of the proxy generator methods. The generator can be either a CSharpCodeProvider or a VBCodeProvider. Each of the methods accepts an iterator pointing to the list of classes to be generated. Although only two classes are listed in the following example, proxy classes for Sample.Address and Sample.Employee are generated automatically because they are used by Sample.Person and Sample.Company. In this example, no special namespace will be generated for the proxy code, a complete set of inherited methods will be generated for each class, and no extra code will be generated for use by mobile applications. The errors parameter will store the error messages (if any) returned from the proxy generator method call. All three methods use this parameter. This example generates a C# proxy file named WizardCode.cs in directory C:\MyApp\. The file will contain code for Sample.Person, Sample.Company, Sample.Address, and Sample.Employee. This example generates a single VB proxy file for each class. The proxy files for Sample.Address and Sample.Employee are generated automatically because they are used by Sample.Person and Sample.Company. Browse to the generated proxy file (or files, if you chose to generate one file for each class) and click Add. The file will be listed in the Visual Studio Solution Explorer. You can now use proxy objects as described in the following sections. A generated proxy class is not updated automatically when you change the corresponding Caché class. The generated classes will continue to work as long as there are no changes in the signatures of the properties, methods, and queries that were present when the proxy classes were generated. If any signatures have changed, the proxy class will throw CacheInvalidProxyException with a description of what was modified or deleted. The proxy file generators also provide proxy methods for certain classes inherited from the standard Caché Class Library. For example, the Sample classes inherit methods from Caché %Library.Persistent and %Library.Populate. Proxies for these methods are automatically added when you generate the proxy files. This section provides a quick summary of the most commonly used methods. For more detailed information on a method, see the entries for these classes in the Caché Class Reference. For a generic guide to the use of Caché objects, see Working with Registered Objects in Using Caché Objects. Id()  Returns the persistent object ID, if there is one, of this object. Returns a null string if there is no object ID. Save()  Stores an in-memory version of an object to disk. If the object was stored previously (and thus, already has an OID), Save() updates the on-disk version. Otherwise, Save() saves the object and generates a new OID for it. Open()  Loads an object from the database into memory and returns an OREF referring to the object. OpenId()  Loads an object from the database into memory and returns an OREF referring to the object. OpenId() is identical in operation to the Open() method except that it uses an ID value instead of an OID value to retrieve an instance. ExistsId()  Checks to see if the object identified by the specified ID exists in the extent. DeleteId()  Deletes the stored version of the object with the specified ID from the database. Extent()  This is a system provided query that yields a result set containing every instance within this extent. KillExtent()  Deletes all instances of a class and its subclasses. Populate()  Creates a specified number of instances of a class and stores them in the database. OnPopulate()  For additional control over the generated data you can define an OnPopulate() method within your class. If an OnPopulate() method is defined then the Populate() method will call it for each object it generates. PopulateSerial()  Create a single instance of a serial object. For a working example that uses the KillExtent() and Populate() methods, see the Proxy_6_Repopulate() method in the bookdemos sample program (see The Caché .NET Sample Programs). Caché proxy objects can be used to perform most of the standard operations on instances in a database. This section describes how to open and read an instance, how to create or delete instances, and how to alter and save existing instances. In this example, person.Home is actually an embedded Sample.Address object. It is automatically created or destroyed along with the Sample.Person object. For a working example, see the Proxy_1_ReadObject() method in the bookdemos sample program (see The Caché .NET Sample Programs). For a working example, see the Proxy_2_SaveDelete() method in the bookdemos sample program (see The Caché .NET Sample Programs). In some cases, an object that is returned from the server differs from the object that the client requested. For example, the client may request an instance of Sample.Person, but the server returns Sample.Employee. In order to instantiate an object of the desired class, the binding has to know the exact name of the proxy type, including the application namespace (if any). When a proxy class is generated, there is an option to specify the namespace that contains it. For example, if the application namespace is MyAppNsp, the Sample.Person proxy class can be specified as MyAppNsp.Sample.Person. Alternatively, the object could be generated as Sample.Person and then "MyAppNsp" could be assigned to the connection.AppNamespace property. Either option allows the binding to deduce that the full name of the proxy type is "MyAppNsp.Sample.Person". The first line creates object p, and loads Sample.Person in memory. In this case, the binding does not need to the full name, and x.Y() will not throw an exception. When the first line is commented out, the second line will fail if the full name of the proxy class is actually something like "MyAppNsp.Sample.Person". Always use Close() to destroy a proxy object. Object reference counts are not maintained on the client. Every time the server returns an object (either by reference or as a return value) its reference count is increased. When Close() is called, the reference count is decreased. The object is closed on the server when the count reaches 0.
person = nothing; //Do NOT do this! This closes the proxy object on the client side, but does not decrement the reference count on the server. This could result in a situation where your code assumes that an object has been closed, but it remains open on the server. By default Close() calls are cached. Although the proxy object can no longer be used, it is not actually destroyed until the reference count can be decremented on the server. This does not happen until the server is called again (for example, when a different proxy object calls a method). This causes a message to be sent to the server immediately, destroying the proxy object and releasing its resources. Display.WriteLine("person " + ID + " exists: "
In this example, the Command.Connection property has been set to CacheConnect, and Command.CommandText contains the predefined ByName query string. The CacheParameter and CacheDataReader ADO.NET Managed Provider classes must be used to define parameters and execute the query, just as they are in an ADO.NET SQL query (see Using SQL Queries with CacheParameter). However, this example will use the query to return a set of object IDs that will be used to access objects. For a working example, see the Proxy_3_ByNameQuery() method in the bookdemos sample program (see The Caché .NET Sample Programs). Caché proxy objects interpret Caché collections and streams as standard .NET objects. Collections can be manipulated by iterators such as foreach, and implement standard methods such as add() and insert(). Caché lists ($List format) are interpreted as CacheSysList objects and accessed by instances of CacheSysListReader (in the InterSystems.Data.CacheTypes namespace). Collections of serial objects are exposed as .NET Dictionary objects. Serial objects are held as global nodes, where each node address and value is stored as a Dictionary key and value. For a working example, see the Proxy_4_Collection() method in the bookdemos sample program (see The Caché .NET Sample Programs). If a Caché database defines a relationship, the Caché Proxy Generator will create a CacheRelationshipObject class that encapsulates the relationship. The Sample.Company class contains a one-to-many relationship with Sample.Employee (which is a subclass of Sample.Person). The following example opens an instance of Sample.Employee, and then uses the relationship to generate a list of the employee's co-workers. For a working example, see the Proxy_5_Relationship() method in the bookdemos sample program (see The Caché .NET Sample Programs). In order to provide your own output redirection, you need to implement an output method with the same signature as OutputToConsole, create an OutputRedirection object with the new method as its delegate, and then assign the new object to the OutputRedirectionDelegate field of a connection object. Input from Caché Read statements can be redirected in a similar way, using an InputRedirection delegate. For a working example, see the Proxy_7_Redirection() method in the bookdemos sample program (see The Caché .NET Sample Programs).